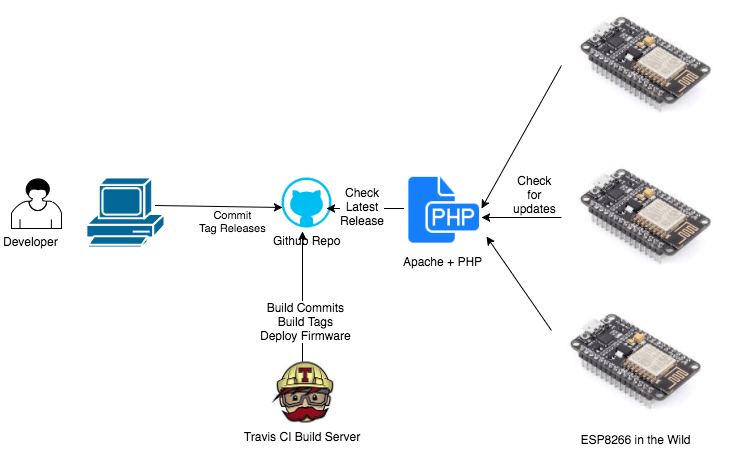 Establishing a ‘Continuous Delivery Pipeline’ for ESP8266 Projects using ESPhttpUpdate « Adafruit Industries – Makers, hackers, artists, designers and engineers! The integration of the ESP8266 framework into the Arduino IDE brought ease of use for development. This was further improved when firmwares could be pushed over the local network to the test devices with the direct over-the-air feature. But what if your ESP8266 devices are no longer in your own network? How can you then update all the devices which are running an older version of your firmware? The Arduino/ESP8266 crew also has an answer for that: the ESPhttpUpdate class lets you download the latest firmware from a web server and replace the old one, required that the available flash memory is twice the size of the firmware. That’s great, but how does the firmware get to the web server? And how do I make sure that only changed firmware gets updated? In the following post I will describe a workflow which will let you automagically update your devices with just a few clicks, once you have working setup.